TENORI-ON is the innovative music instrument that has been taken about 6 years for its completion, created by Toshio Iwai, a leading media artist in Japan. It has 16 x 16 LED buttons laid out on its surface. Each button lights in response to sound sequence so that you will be able to feel sound in both your eyes and ears. 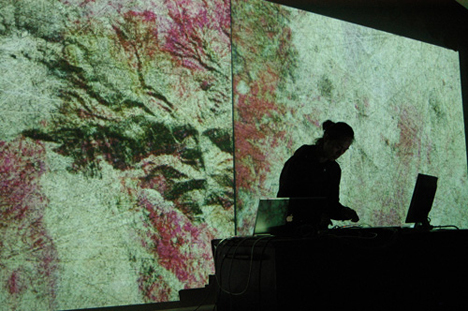 PRE-VIEW & AFTER-VIEW, the live event featuring TENORI-ON, has held at Cay in Aoyama on April 24th and 27th: ‘PRE-VIEW’ of 24th has featured live performance by To Rococo Rot, Mapstation and Robert Lippok, and ‘AFTER-VIEW’ of 27th by audio visual artists such as Atom Heart, Paul de Joung, RYOICHI KUROKAWA and DE DE MOUSE. Here we have a report on the ‘AFTER-VIEW’ event where Atom Heart (Senor Coconut) has performed with TENORI-ON. He has released in vast numbers of music using several different names from the beginning of the 90’s until now. Recent release has done by a name, Senor Coconut. 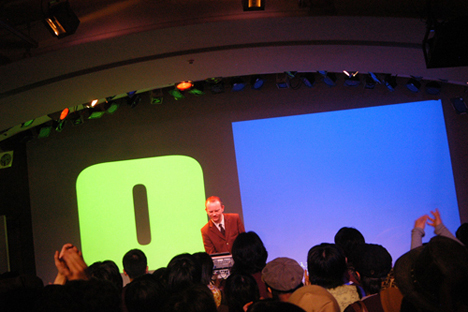 Atom Heart for this time performed a full set live with TENORI-ON. 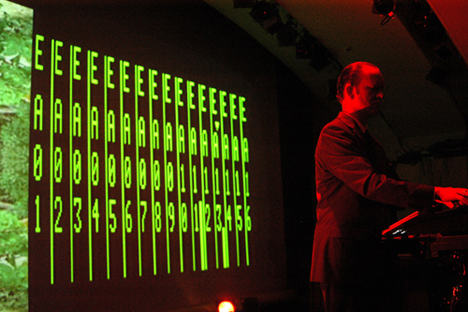 On the left hand side of the back screen behind Atom Heart’s performance there showing a film with his distinctive senses which was similar to his music, and on the right hand side of the screen showing an interface of AKA MPC which was synchronized with TENORI-ON, so that you would be able to see how the artist was working with TENORI-ON and how he was making adjustments the parameter. The performance has definitely satisfied audience’s pure interests in how he used TENORI-ON and the interests in the film itself at the same time. As you look at Atom Heart playing with a great control of TENORI-ON, you will be honest to feel humor and madness of German electro music influenced by Kraftwerk, his stoic-ness to music and love and joy. The latest album, a Latin coverage of the world’s famous music, ‘Around the World‘ has just been released by not Atom Heart, but in the name of Senor Coconut. 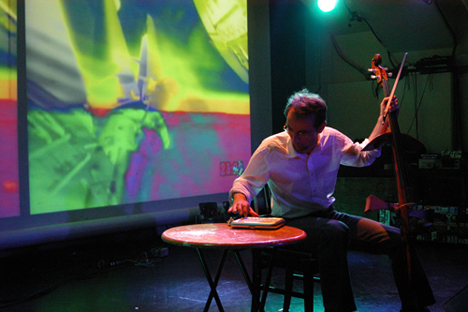 Paul de Joung has played with an electric cello and TENORI-ON to make a relax moment for his entire performance. He gave us a feel for rich moment for the Sunday night event. 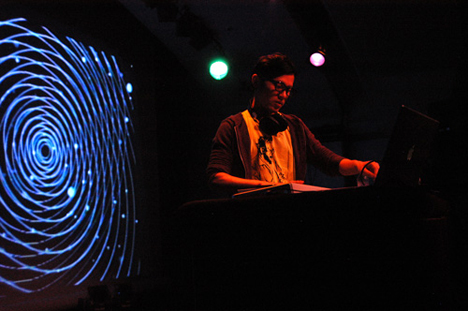 The whole event was a very genre-less one where you could have an experience contrast between the entire performance with solid sound and film by RYOICHI KUROKAWA and the well facile pop sound by DE DE MOUSE. Each artist showed each different uses of TENORI-ON. This will allow us to imagine different possibilities that TENORI-ON bears. 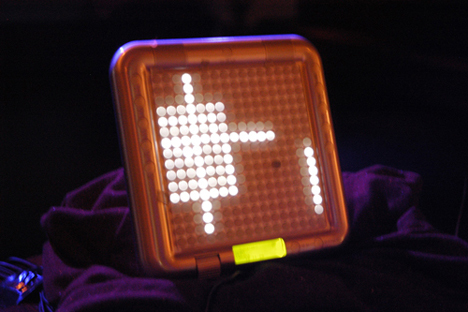 TENORI-ON is the tool to be able to experience how fun to create music by touching it for every one of those who has not familiar with any instruments. For this reason, we will expect to see surprising use of TENORI-ON in the future and will expect to see creations of possibilities of new music. Support from: Yamaha Corporation, TCHES, INC.